Unless otherwise acknowledged, all quotes are from personal communications with the author. Japanese names throughout this article have been written in Japanese order (family name first). An earlier version of this article appeared in the magazine Bixobal. The name Stomu Yamash'ta generates an extremely wide variety of reactions from music aficionados. To some he is the early '70's avant garde percussion prodigy, whose depth and delicacy grace definitive recordings of works by Takemitsu Toru and Peter Maxwell Davies. To others, he's a leading player in the jazz-rock fusion supergroup Go starring Steve Winwood, Klaus Schulze, and Al Di Meola. Perhaps a few will recall his occasional but thrilling contributions to film scores such as Ken Russell's The Devils and Nicolas Roeg's The Man Who Fell to Earth. A closer look at Yamash'ta's career reveals in fact a fascinating trajectory of a radical composer-performer whose original intent to bridge the gap between Eastern and Western musical sensibilities would eventually produce a unique body of work, at once deeply cosmic and spiritually driven. Piecing together a complete history of Yamash'ta's musical development using English language sources can be a frustrating endeavor. Most of the early information about him in English comes from liner notes and press notices; beyond that, only strands of information are available, for the most part uncollected or uncorrected. Equally frustrating is the limited Western exposure of his most interesting and rewarding works. Having been fortunate to speak with Yamash'ta recently, I hope to correct a good deal of misinformation that has been reiterated wholesale over the years, as well as shed some long overdue light on his more elusive and recent recordings. Yamash'ta was born Yamashita Tsutomu1 on March 15, 1947 in Kyoto. His father was a high school music teacher and conductor of the Kyoto Asahi Philharmonic Orchestra who encouraged his son to study music at an early age. Already by age 8, Yamash'ta showed an immediate gift for all percussion instruments – timpani, chimes, woodblocks, vibraphones and xylophones – and by the time he was in high school, he managed the feat of performing with six sticks simultaneously. His gift and his age both attracted attention; at 14, he performed as special guest percussionist at both the Kyoto and Osaka Philharmonic Orchestras. The same year (1961), he also caught the ear of Japan's film industry, being chosen by Ifukube Akira to perform on the score for The Tale of Zatoichi. More film score assignments followed, and soon, he was engaged in regular session work at Shochiku, Daiei, Toei, and Kyoto Film studios, all based in Kyoto. A commonly reported version of this story – that Yamash'ta was hand-chosen by Kurosawa Akira to perform on Satoh Masaru's score for Yojimbo – is an early misconstruction by Western press: Kurosawa's film was made at Toho Studios in Tokyo (the commute from Kyoto would have been a lot to ask of a 14-year-old student on top of scholastic and orchestral duties). In 1963, Yamash'ta made his solo concert debut performing Darius Milhaud's "Percussion Concerto" with the Kyoto Asahi Philharmonic – at 16, the youngest member of the orchestra. His age combined with his extraordinary talent caught the eye of many, including visiting guest conductor Aram Khachaturian, who approached Yamash'ta after a rehearsal and invited him to come and study in Russia. Around this time, Yamash'ta attended a performance in Kyoto by the visiting New York Philharmonic. Yamash'ta's sister, a clarinetist herself and friend of the NYP's clarinetist, arranged a meeting for Yamash'ta with timpanist Saul Goodman. Drumsticks in hand, he asked Goodman for lessons by playing impromptu on a backstage table. Goodman encouraged Yamash'ta to come to the U.S. and study at Julliard. The two corresponded regularly for the next several months, with the young drummer sending tapes to Goodman of his progress. Within a year, Yamash'ta would be able to take Goodman up on his offer. Having saved enough from his film score assignments, Yamash'ta relocated to New York at age 17. Manhattan in 1964 was ground zero for a major turning point in the history of music, still recovering from the shockwave generated by the Beatles' appearance on Ed Sullivan in early February. Dylan was still unplugged, still the poster boy for the Greenwich Village protest-folk movement, only a few blocks away from where the Fluxus crowd was in full force, and although the drug culture was a couple of years shy of national attention, ‘happenings' were the cultural buzzword. There was artistic electricity in the air, as the boundaries of "acceptable" art and performance were being shattered almost daily. Uptown at Julliard, all that may as well have been another planet for the young man from Kyoto. His visa granted on Goodman's recommendation, Yamash'ta took mid-semester lessons and unofficially attended Goodman's class for the remainder of the term during which he arrived. His small apartment ended up being the only place where he could practice – Julliard, not yet at its Lincoln Center location, had only two practice rooms at the time for the entire school – though complaints from neighbors naturally limited his opportunities. When he wasn't practicing, he jumped head-first into his closet passion: jazz. Almost every night, Yamash'ta found himself in one of the many small smoky clubs collectively hiving the hotbed for the free jazz scene, mesmerized by the sonic cosmos forming around celestial bodies like John Coltrane, Charles Mingus, Eric Dolphy and others. Interestingly, the shockingly unconventional new sounds offered by the avant garde performance world held no allure for him, aware of its activity though he was. Ultimately frustrated by the lack of ideal practice space, his mind was made up by the time he heard other students talk of their upcoming summer programs in Colorado and Michigan. Though Goodman was pushing Aspen, Yamash'ta gravitated towards Interlochen, courted doubly by a full scholarship and the surrounding greenery that was more like his native Kyoto. He had continued to correspond with Khachaturian who reiterated his offer of study, but Yamash'ta again politely declined, lacking any working knowledge of Russian and being insatiably curious about the modern music scene in America. He arrived at Interlochen Arts Academy camp that summer and was immediately given first chair. By summer's end, he secured a scholarship to attend as a student that fall, and study with the man who would set his career in motion, Thor Johnson. Throughout his career, Johnson was dedicated to advancing both musicianship and music itself, having commissioned dozens of works by modern composers (including Henry Cowell's "Variations for Orchestra" in 1956). His tutelage at Interlochen was rigorous, and equally driven to promoting new talents, frequently programming works for performances to showcase principal players. By all accounts, Yamash'ta's talent was clearly evident when he first began under Johnson, and his performing style progressed gradually through the semester. Fellow classmate and percussionist Michael Udow remembers that Yamash'ta "already knew how to visually communicate the music physically, and used it to elicit certain sounds from the instruments." The Interlochen orchestra would perform regularly during the school year at neighboring universities, with Shostakovich's "First Symphony" and Hindemith's "Symphonic Metamorphosis" spotlighting Yamash'ta's evolving abilities. The Shostakovich symphony was the first piece where the percussionist's acrobatic style evolved, according to Johnson's assistant Hal Cruthirds. Yamash'ta's dedication to perfecting his abilities was well-suited to Johnson's demanding methodology. Cruthirds recalls, "Stomu was always interested in new ways to express himself with the sounds that he loved… He had a way of producing the most beautiful sounds from everything he touched." Yamash'ta also studied with Jack McKenzie, who ten years earlier had played kithara and conducted on a couple of Harry Partch's early recordings, and took lessons from future avant garde virtuoso Michael Ranta. Ranta was something of a "bad boy" at Interlochen, often instructing his students in more modern compositions by John Cage and Lou Harrison, much to the consternation of Interlochen's founder and director Joseph Maddy. Ranta remembers Yamash'ta being fiercely ambitious in his pursuit for perfection, to the point of wanting to play virtually all of the time. Ranta, who himself had played with Harry Partch's ensemble years earlier, acquainted the young Yamash'ta with as much modern music as he could in the one year that he taught him. Upon graduating, Yamash'ta was given a teaching position for what he later called a good salary, but resigned very shortly thereafter to pursue studies in Boston. The Berklee School beckoned as the locus for his study of jazz, and he immediately found himself surrounded with completely like-minded souls (including fellow student Harvey Mason). Here he met fellow countryman Sato Masahiko, who was beginning two years of studying composition and arrangement. The two men bonded over their fascination with the burgeoning avant-jazz scene, spending much if not all of their social time together talking about the possibilities gestating in the new form. Though they only played together a handful of times, they vowed to collaborate at some point in the future. Yamash'ta remembers Sato being insatiable for contemporary music which he had not yet performed himself, constantly seeking the edge of modern jazz even as it was progressing. An oft-repeated story throughout the years has Yamash'ta forming the International Modern Jazz Quintet with Jaki Byard while at Berklee; again, a misappropriation of facts. The small session band, which lasted less than a year, was actually co-formed with Brian Gascoigne, who would later appear on Yamash'ta's albums with East Wind and Raindog. Yamash'ta had in fact met Byard years earlier during one of his many downtown pilgrimages in New York, but how their connection was transplanted to Boston is a mystery. In 1968, he guested with Akiyoshi Toshiko's band at the Town Hall in New York playing a part written especially for him, although the performance was not officially recorded or broadcast. Aside from this one stint, Yamash'ta returned to the Classical world and toured again with Thor Johnson and the Chicago Little Symphony. The featured work was "Odoru Katachi" by Heuwell Tircuit, a percussionist himself turned composer. "Odoru Katachi" (roughly translated as "The Essence of Dance") was actually commissioned by Johnson in 1962 for the Chicago Little Symphony, and although different percussionists had performed the work on previous tours, Yamash'ta's interpretation made a distinctive mark. "Thor had a large bronze prayer bell for ‘Odoru Katachi' which was used for all the performances. Stomu was able to produce a sound by rubbing it with a felt covered stock from barely audible to a full resonating sound that filled any hall." Tircuit himself was no less than stunned by what Yamash'ta brought to the piece: "Stomu could do things I'd not thought possible. He was wildly sensitive to timbre and could produce the illusion of legato for a singing line. His dexterity was like that of a nervous squirrel in constant motion and intense concentration... His energy levels were almost frightening." This tour seems to be when Yamash'ta first received notoriety and mention in the music press. His acrobatic style, characterized by literal leaps and bounds across the instruments, caught the attention of critics and composers alike. The San Francisco Chronicle's Robert Commanday seemed to delight in Yamash'ta's "nervy abandon," further adding, "Yamash'ta, a flame, gives a theatrical dance while making his whole store of hardware virtually talk and sing. His is a new style. "2 One performance of this work was broadcast on Chicago's "Artist's Showcase" television program, but copies do not appear to have been archived in any official repositories. For the next year, Yamash'ta played with a number of orchestras as guest musician for extended periods, including the Boston Opera and the Chicago Chamber Orchestra3. 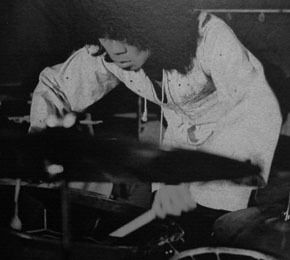 In November 1968, Yamash'ta performed his first composition for public consumption, a ballet for solo dancer titled "The Fox," scored for live percussion played against previously taped material (a technique he would exploit later when recording the famous Red Buddha album). Yamash'ta had always been interested in composing, but as is de rigueur in classical training, never received encouragement. He wrote pieces for himself already while studying in Japan, but never performed them for anyone. "The Fox" marked his debut as a composer, and although never officially recorded, it was apparently broadcast on San Francisco public television that same month. In 1969, Tircuit was commissioned by Illinois' famed Ravinia Festival to write a work for the Chicago Symphony Orchestra, with Yamash'ta as featured soloist. The composer originally had no intention of writing another percussion piece and initially declined, but Yamash'ta pleaded with him to do so. The result was the "Concerto for Solo Percussion and Orchestra," designed by Tircuit to be "an extremely demanding piece, full of unusual techniques." Upon first reading the score, Yamash'ta told the composer, "I'll have to record this before I'm 30 or I won't be able to play it anymore." It's worth noting the instrument roster from Time's review: "four full-grown timpani, four little timpani, three barrel drums, nine objects that resembled brass flower pots (they were Buddhist prayer bells), an array of bamboo, glass and wooden utensils, and lots and lots of gongs"6 – 47 instruments in all, by official count. For Yamash'ta, his acclaimed theatrics were not motivated by showmanship but genuinely expressive of his relationship with the sounds: "I never felt I was ‘acrobatic' – for me, it was necessary to perform the music. I never tried to make a showcase of the technique." Later that winter, in January of '69, Yamash'ta found himself in Toronto attending the world premiere of Takemitsu's "Asterism for Piano and Orchestra," performed by Takahashi Yuji (who "played at the piano like a percussionist," Yamash'ta remembers). The trip proved fortuitous as Yamash'ta met the composer for whom he had long had an enormous respect. Much to Yamash'ta's surprise, Takemitsu had already been familiar with his ambidextrous agility. They discovered that they shared a mutual understanding for the delicate harmony of traditional Japanese and Western music, and for the unique importance placed on percussion in Eastern music. For years, Takemitsu had been interested in exploring areas uncharted by most concert hall works, but never encountered any percussionists whom he thought would be capable of executing what he envisioned. "When we met," Yamash'ta recalls, "we had no doubt about each other." Now fueled, Takemitsu set about to arrange two works-in-progress into solo pieces, both of which would eventually become standouts for both composer and performer. The Sculptures Sonores-based "Seasons" was originally written for two percussionists (Michael Ranta and Yamaguchi Yasunori debuted the work at the Sound Space Theater of the Steel Pavilion at Expo '70 in August of that year), but Takemitsu was determined to see it performed solo. By December ‘70, it was fully arranged for one performer amid a single glass trombone and an ocean of Baschet brass against a pre-recorded tape of electronic sounds. Yamash'ta premiered the work in Paris the following year to resounding notices. "Munari by Munari" followed a year later, a years-in-the-making collaboration with the prolific Italian sculptor and designer Bruno Munari. The score consisted of conceptual instructions and graphic icons based on the paper sculptures in Munari's "Invisible Book". From Takemitsu's program notes: "In percussion performance the choice of a single mallet can change entirely the spatial aspects of sound. Virtually no instrument questions [i.e., challenges] the creativity of the performer so demandingly as percussion instruments. Percussive sounds express not the passage of time in its concrete, physical dimension, but the metaphysical, eternal flow of time as well. "7 It's easy to see why the two men would get along so well. The year saw another fortuitous meeting. Hans Werner Henze, fresh from publicly avowing his strong left-wing political views, met Yamash'ta when visiting Chicago to guest-conduct with the Little Symphony. The young drummer demonstrated a number of traditional Japanese instruments for Henze, who later said he had never heard anything like the sounds Yamash'ta was able to produce. He asked Yamash'ta on the spot if he would perform in his upcoming chamber opera "El Cimarron," scheduled to premiere at the Aldeburgh Festival in England the following winter. Yamash'ta eagerly accepted the invitation for his first European appearance. Back on January 19, 1970, "El Cimarron" premiered at Aldeburgh to largely enthusiastic reviews. A vibrant work for baritone, guitarist, flutist, and percussionist, the work was generally well-received, with Yamash'ta again receiving favorable attention in the press. As recorded, the tale of a freed Cuban slave's return to 19th century society offers little opportunity for Yamash'ta's talents to come to the fore, in spite of an illustrious score for the percussion section. While at the festival, Yamash'ta would meet a kindred spirit in the form of drummer Morris Pert. Bonding over their love of jazz and musical expression, Pert invited Yamash'ta into the jazz-rock band he had just joined called Come to the Edge. This was the spark which would form the parallel universe in which Yamash'ta would travel for the bulk of the decade. Yamash'ta's plan had been to return to the States after Aldeburgh, but the success of "El Cimarron" led to a brief tour of the work on the continent, during which Yamash'ta became fascinated by the European music scene ("American contemporary music was very narrow at the time,") and elected to stay. The year saw several performances throughout Europe, the States, and Japan, his repertoire now including the original compositions, "Prisms" and "Hito", Leo Brouwer's "Exaedros II," and solo variations on Tircuit's "Odoru Katachi." Yamash'ta and Tircuit had stayed in touch regularly over the years. During a brief stay at the composer's apartment while en route to Japan, Yamash'ta asked Tircuit to compose a solo piece for an impending recital – in all of three days. Tircuit suggested instead that Yamash'ta improvise variations on "Katachi" much as he had for the solo Tropes in Tircuit's "Concerto," and that Yamash'ta line up his instruments in a row across the stage and into each wing, performing from rear stage left to rear stage right. The proposal worked, and a year later Yamash'ta recorded the results. As Yamash'ta's exposure and reputation in the classical world grew, several composers took notice of his prodigious talents and naturally sought to capitalize on them. A month after the Aldeburgh Festival, Yamash'ta debuted Leo Brouwer's "Exaedros II" at the Berlin Festival, apparently co-conducted by Henze and Brouwer. Peter Maxwell Davies, then Britain's enfant terrible of modern music, had also met Yamash'ta at Aldeburgh and composed "Turris Campanarum Sonantium" (or "Bell Tower") especially for him at the end of that year. Henze again requested Yamash'ta's abilities for the premiere of his über-Socialist mini-opera "Der langwierige Weg in die Wohnung der Natascha Ungeheuer" (or, "The Tedious Way to Natascha Ungeheuer's Apartment") in September 1971, which had Yamash'ta performing alongside Peter Maxwell Davies' Fires of London and Gunter Hampel's Free Jazz Ensemble. That October, Yamash'ta premiered Takemitsu's "Munari by Munari" in Paris. References from the period cite other works being composed for Yamash'ta around this time: a concerto by Morton Gould, and a percussion piece by Donald Erb, a presumably unrealized piece for the 1972 Olympics opening ceremony by Shinohara Makoto (although Yamash'ta did perform a solo arrangement of Shinohara's "Alternance" in concert), and a work by Gyorgi Ligeti which sadly never came to fruition either.